Indiana EyeCare Center is a full scope practice dedicated to providing the highest quality vision care to children and adults in a friendly, comfortable, and professional atmosphere. We go beyond checking for 20/20 vision by not only evaluating your eyesight and eye health, but also screening for conditions that could effect your visual performance. 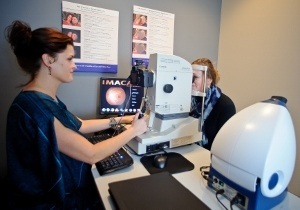 We want the Indiana EyeCare Center to serve as your family's eye care practice for life. We work to earn that trust through investment in new technology for clinical eye care, continuing medical education for doctors and staff, a large inventory of optical lenses, contact lenses, economical and designer eyeglass frames, and on-site optical lab service. 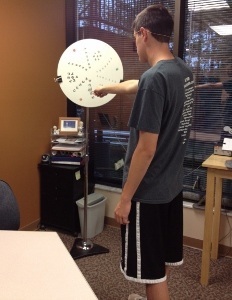 The Vision Therapy Center of Indiana is a separate specialty practice affiliated with the Indiana EyeCare Center. It shares the same office suite as the Indiana EyeCare Center. The staff of the Vision Therapy Center specialize in the treatment and management of developmental vision delays as well as "hidden" vision problems that can affect visual performance in work, school or sport activities. Dr. Cynthia Jay Frischmann is the director and founder of the Vision Therapy Center. If a patient is interested in determining whether they would benefit from vision therapy, a recent (last six months) complete eye health evaluation is required to rule out eye disease and the need for a new or updated eyeglass prescription. After this eye health evaluation, a vision therapy evaluation will be scheduled. This specialized evaluation will take approximately one and a half hours and will test for both visual efficiency and visual perceptual skills. A week later a follow-up consultation will be scheduled to review the test findings and to discuss the benefits of vision therapy. A detailed written report will be given at this time. For more information about common symptoms and vision therapy success stories, please visit our website of www.visontherapyofindiana.com. If an updated eye health evaluation is needed, this can be done through the Indiana EyeCare Center portion of the practice. Please call the office (317)915-3937 to schedule your appointment. Dr. Cynthia Jay Frischmann is a Indianapolis native growing up and attending schools on the Northeast side of the city. After graduating Indiana University, she received her Doctorate from the Illinois College of Optometry then returned to the Indianapolis to practice. She worked in two private optometry practice for eight years before founding the Indiana EyeCare Center. She was instrumental in the location and design of the current present facility. In 1993, Dr. Frischmann began specializing in the treatment and management of developmental vision disorders that effect learning as well as visual difficulties that effect sports performance. She is one of the few doctors in the Indianapolis area who specializes in this area. The patients that seek this specialized care range from those who are recovering from a traumatic injury, have a hidden vision problem that interferes with near work and/or effective learning, or want to heighten their visual performance in their particular sport. Through an individually doctor designed vision therapy program and with guidance of a trained vision therapist, certain activities and exercises help the patient teach himself better visual awareness and control.